Free Your Mint, Let It Go Wild!!! I suppose it is fair warning to tell people that Mints tend to want to take over a garden, just in case they do not want that. I however, am perfectly happy with my 7 types of mint taking over the whole lawn if they want; and they are welcome to leave my property and go visit other places if they so choose. Sure you can try to wall it in, or keep it in a pot, but I say let it go! 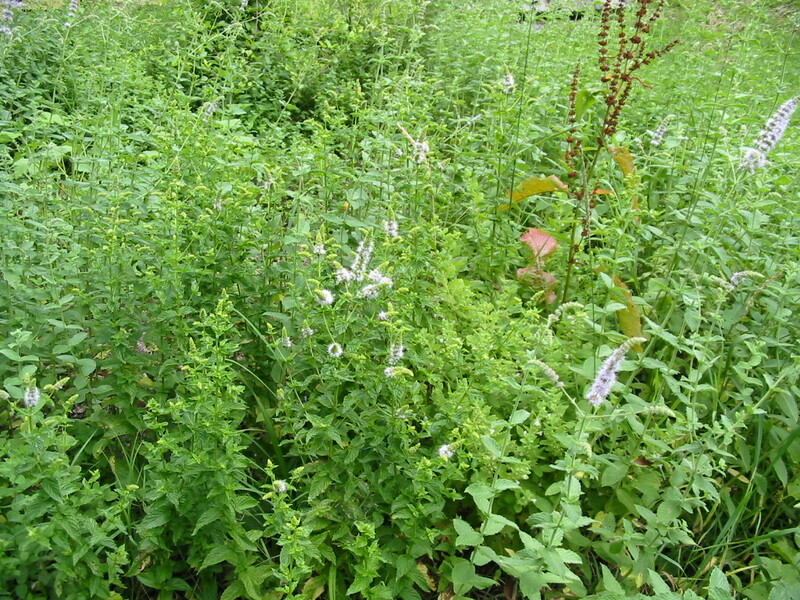 Stop trying to control mint, when it is such a perfect plant, much better than lawn grass (or crab-grass). In fact it is my favorite type of plant because it is so independent, and edible, and gives us nice flowers to share with the bees and butterflies. In the photos you can see how mint looks when it is given the freedom to explore a garden. The photo is taken after years of trying to control the mints. The year before the photos were taken, the entire garden was stacked with wood and burned in a bonfire. The mint regrew from their own roots. Years after the photos, trucks and bulldozers drove over the site crushing everything. However the mint is back…on its own! 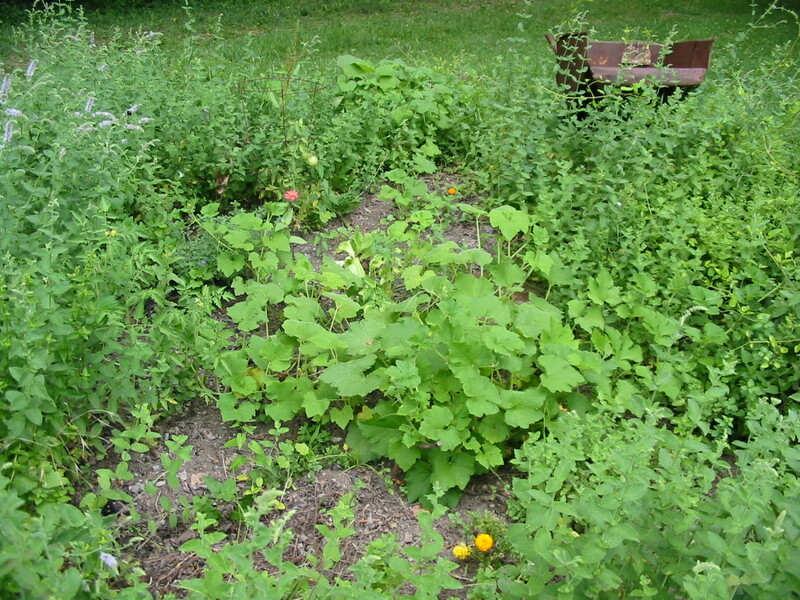 You can clear areas of the mint to temporarily grow other things, like vegetables (see photos for a center crop of squash), and then when the veggies are done, the mint will close the gap again as only the strongest weeds can. Why fight such a beneficial and pleasant herb? I say, let the mint grow!!! Peppermint, Spearmint, Lemonbalm, Beebalm, and even the mighty Applemint. Let it grow, let it grow, let it grow. Go “mintal” and get “balmy”. 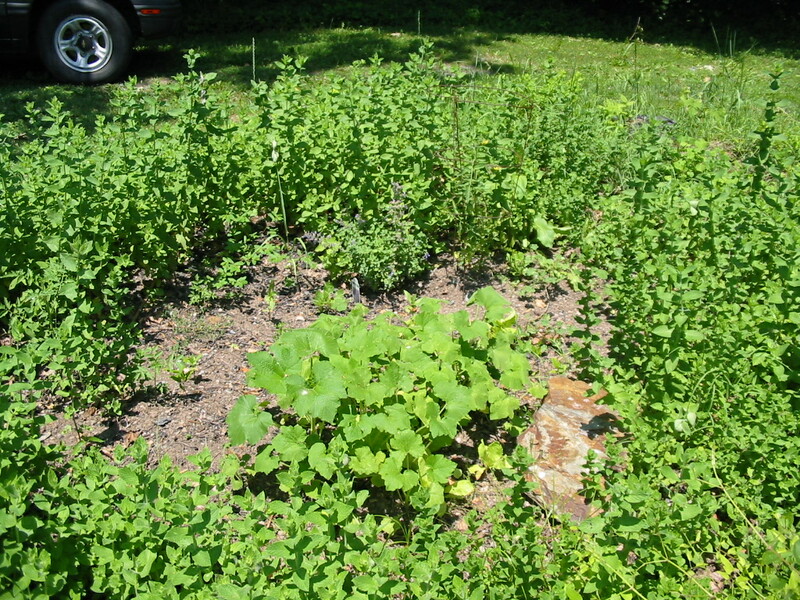 This entry was posted on April 19, 2012 at 1:34 am and is filed under Organic Gardens with tags applemint, beebalm, garden, gardening, gardens, lemonbalm, mint, odd fellows, organic, peppermint, SCOD, spearmint. You can follow any responses to this entry through the RSS 2.0 feed. You can skip to the end and leave a response. Pinging is currently not allowed.